I missed the Avengers train somewhere along the line and never had time to jump on. The franchise is huge, producing multiple movies about select characters, a series of films about the whole team, and spinoff TV shows, action figures, & god knows what else. I saw the first Iron Man movie, that’s something, but I skipped the Thors, the Captain Americas, the Hulks, and even the first Avengers film. I don’t know, it’s just not my thing, though I can’t say they all look terrible. I actually think the new Avengers: Age of Ultron trailer looks pretty cool. And in that vein, here’s my introduction to the popular story lines, albeit in an animated and much older form. This is the tale of the forming of the Avengers. General Nick Fury, head of the S.H.I.E.L.D. organization, needs to put together a team of heroes to combat an alien threat, an evil that was temporarily defeated after WWII, but never went completely away. The man he needs to head the team has been missing since that time, Captain America, the world’s first Super Soldier. He’s been frozen since the 40s, but Fury has found & revived him. Now he just needs a few others to turn the tide of the war. Black Widow, Fury’s right hand woman and weapons expert, joins up. So does scientist Bruce Banner, who turns a little green when he gets mad. Next up, Hank & Janet Pym, also known as Giant Man & Wasp. And last but not least, two heroes who usually work alone: Iron Man and Thor. Together, the Avengers will protect the world, if only they can get along. The next time someone scoffs at me for not watching the Avengers movies, I’ll ask them if they’ve seen the film that came before them all. And I’ll just leave out the fact that it’s a cartoon. But seriously, this film taught me a lot about the comic franchise. My son is a big fan of Marvel superheroes, so I knew a lot of origin stories coming in, but now I see how they all fit together to create a team. The film looks like an old G.I. 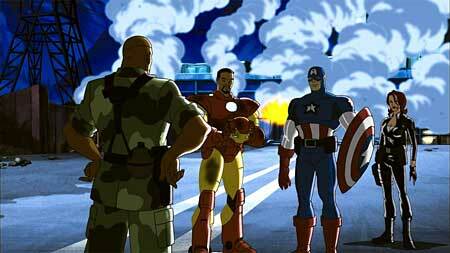 Joe episode, with animation that will not impress, action that’s mostly explosions & characters flying across the screen. But there’s something classic and cool about it, like I was watching an original television show from the 70s or something, a quick trip back in time that’s actually modern. Will you love this movie? Perhaps not, and I didn’t, though I appreciated what it was; a quick attempt at capturing the comic story arcs and presenting them in an entertaining way.